Providence is increasing their weightings for clients to European Equities funded from US Equities. 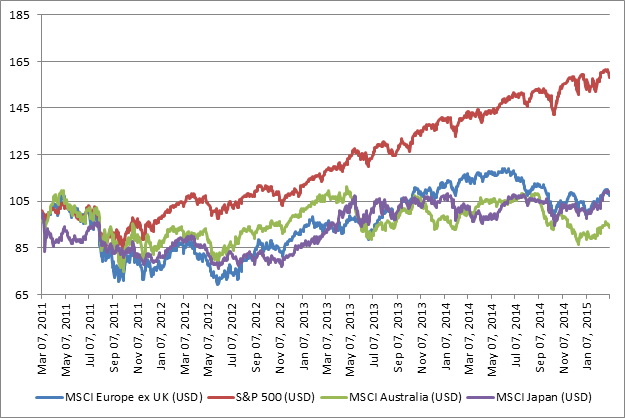 In an environment of stretched equity market valuations European stocks appear better value than their US counterparts. European equites are trading on 16x mid cycle earnings vs. US equities at 17.4x peak earnings. On a forward looking basis MSCI Europe is trading on 14x depressed earnings vs. US 17.5x. There is large operational leverage within European companies from depressed current depressed levels. The Implied Equity Risk Premium in Europe is 5.7% vs. 0% in the US. The lower Euro and Oil price should be a major beneficiary to European economies. Aggressive QE should assist credit creation and boost asset values. However we must remember the dominance of US companies regarding market capitalization. For example Apple alone is the same size as the whole Spanish equity market and bigger than Italy. See attached Goldman Sachs Report for truly astounding comparisons.